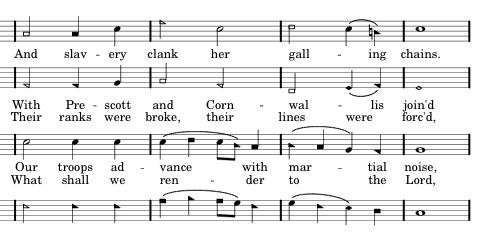 The tune is the exactly the same as #479 in The Sacred Harp, but with different words. 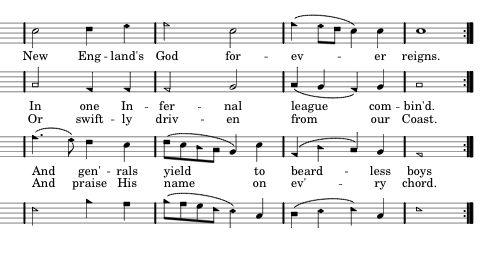 Listen to a pious MIDI file at cyberhymnal of this otherwise rousing tune. Download LilyPond file (4 stanzas). Download LilyPond file (5 stanzas). Dr. Warren Steele's page about this song. More stuff about the national anthem here. And Wikipedia article for Chester (includes the stanza not given here). 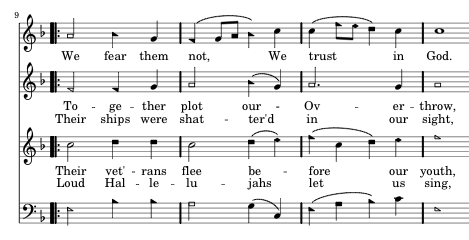 Alternate tune for "My Country, 'Tis Of Thee". Back to Culver City singing main page. Contact: David Olson (310) 410-9033 for more details. Close to "The Spot Cafe & Lounge"